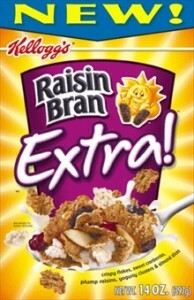 I just love the Kellogg's Raisin Bran Extra! Has a great taste, fast & easy in the morning to fix. I love this cereal it's great! Love the tartness of the cranberries and the sweetness of the yogurt crunches! Great tasting and lots of different textures. I found myself eating the whole bowl instead of leaving the mushy stuff as it had far more texture and taste. Good, but tastes like the regular cereal to me. This is a new favorite cereal! I love this stuff!